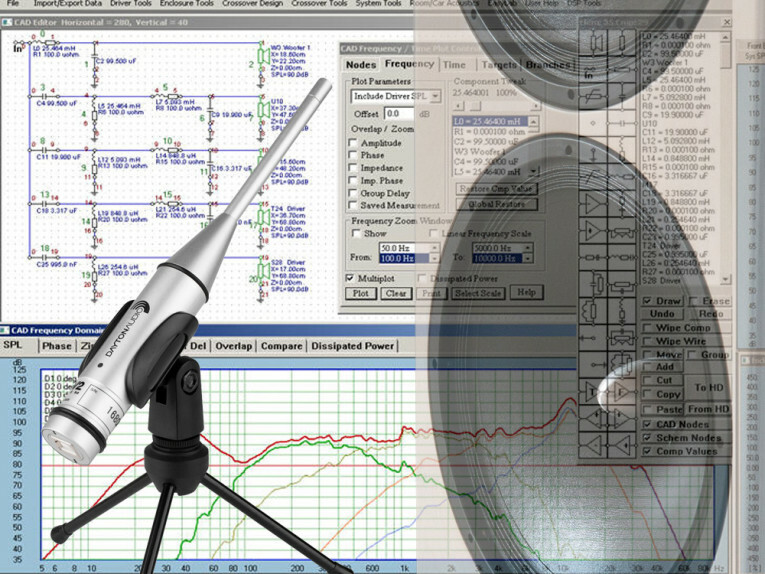 With the availability of low-cost, PC-based acoustic data acquisition systems, experienced hobbyists can make highly accurate loudspeaker frequency-response measurements without an anechoic chamber. The power of these systems comes at a price. These systems window the time-domain measurement to eliminate room reflections. This, in turn, limits low-frequency response. 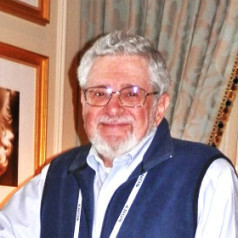 This article was originally published in audioXpress, June 2012. 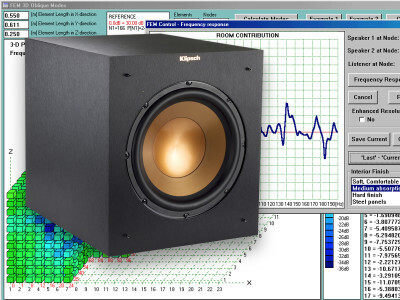 With the availability of low-cost, PC-based acoustic data acquisition systems, experienced hobbyists can make highly accurate loudspeaker frequency-response measurements without an anechoic chamber. Popular systems include: Audiomatica's CLIO, MLSSA, Praxis (now part of the Dayton Audio OmniMic measurement bundle, available through Parts Express and Dayton Audio), and SoundEasy (also available though Parts Express), to name a few. The power of these systems comes at a price. These systems window the time-domain measurement to eliminate room reflections. This, in turn, limits low-frequency response. Typically, response below 200 to 300 Hz is not possible in reasonably sized rooms. The near-field technique — which was proposed by D. B. Keele, circa 1973 — is the commonly accepted way to get low-frequency data without an anechoic chamber. [1, 2] However, there is another technique proposed by R. H. Small in an AES paper, circa 1971. His technique is simple. It does not require phase information and avoids some of the complexity of the Keele procedure, especially when there are multiple radiating surfaces. In this article, I’ll review the Keele procedure and then present Small’s approach. Examples of both are given and discussed. 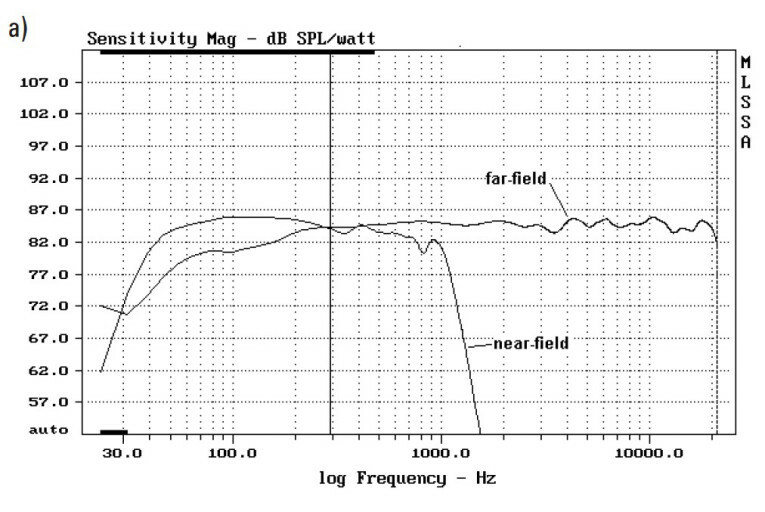 The goal is to measure the on-axis far-field response of a loudspeaker, free of any room effects. Reflected energy from the nearby floor, walls, and ceiling will arrive at the test microphone later than the direct wave. Depending on the path-length difference (therefore, the phase difference between the two arrivals) the reflected waves may add to or subtract from the direct wave. Let’s look at the effect of a single reflecting surface. Figure 1: Floor reflection geometry. 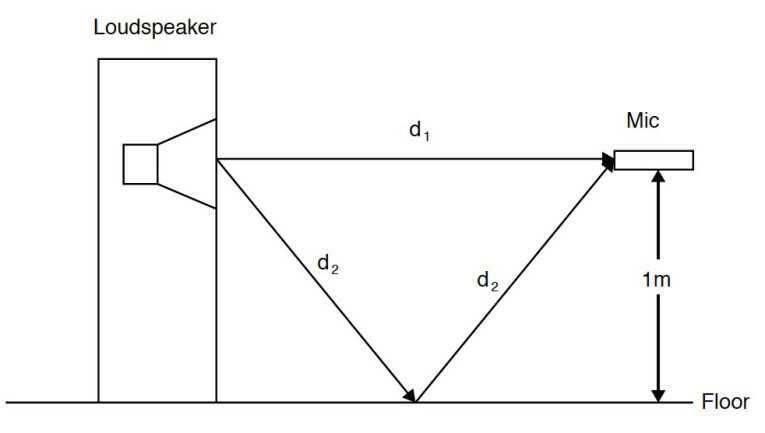 Typically, if the speaker under test is placed on the middle of the floor, far from reflecting walls, the first reflection comes from the floor (see Figure 1). In this figure, the test driver and the test microphone are both at a 1-m height. The direct distance, d1, from driver to microphone is also 1 m. The wave reflected by the floor travels the longer path, 2d2 (see Figure 1). Whenever the distance 2d2 to d1 is equal to an even multiple of a wavelength, the direct and reflected waves will directly add. Whenever this distance is an odd number of half wavelengths, the reflected wave will be 180° out-of-phase and subtract from the direct wave. At intermediate distance-to-wavelength ratios, there will be partial addition or subtraction. The reflected wave will be somewhat weaker than the direct wave, since it travels a longer distance, so the direct wave will not completely cancel. Figure 2: Measured impulse response of small two-way monitor. 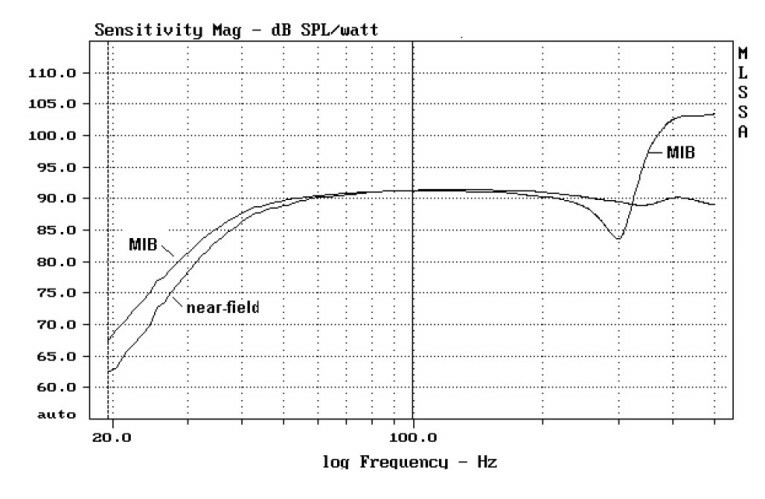 Figure 2 is a plot of the measured impulse response of a small two-way monitor loudspeaker. The MLSSA system was used for this measurement. Additional details on the measurement equipment are outlined at the end of this article. The measurement geometry is similar to that of Figure 1. Remember, the impulse response is the time-domain equivalent of frequency response. The two are related by the Fourier transform. In this test, the direct on-axis wave arrives at the microphone about 2.8 ms after the test signal is applied to the loudspeaker. The floor reflection arrives at 6.3 ms and then there is 3.5 ms of reflection free data. If only the data between markers m1 and m2 is analyzed, the relatively smooth frequency response is shown as curve A of Figure 3. 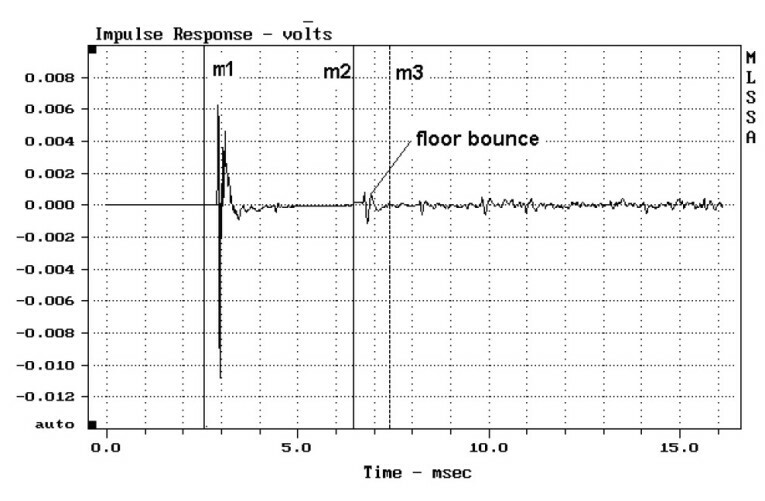 Figure 3: Response data: no bounce (A) with floor bounce (B). This is shown by the black bars in Figure 3 at the top and bottom of the plot. Any part of the curve plotted below that frequency is simply an artifact of the Fourier transform and does not represent valid data. Fortunately, there are ways to get the low-frequency data, which can then be spliced to the high-frequency data to get the full range response. I’ll talk about them next. In the near-field technique, the microphone is placed very close to the driver diaphragm to swamp out baffle and room effects. At low frequencies where the driver diaphragm behaves like a rigid piston, the measured near-field response is directly proportional to the far-field response and independent of the environment into which the driver radiates. Keele describes this technique in his paper. I will summarize the approach and its limitations here. For the near-field technique to work properly, the microphone should be placed as near to the center of the diaphragm as possible. Keele shows that a microphone distance less than 0.11 times the diaphragm effective radius results in measurement errors of less than 1 dB. As an example, a 6.5" driver will typically have an effective cone diameter of 5" or an effective radius of 2.5". For this driver, the microphone should be placed within 0.275" of the driver dust cap. PTOT is the total near-field pressure. PN is near-field pressure of the nth circular radiating surface. DN is the corresponding diameter of the nth radiating surface. 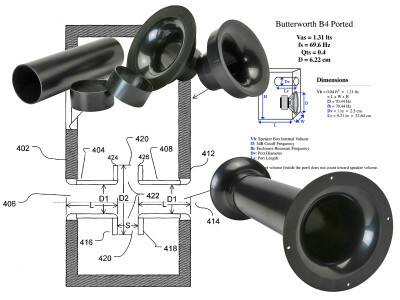 For example, if you are testing a vented loudspeaker with two woofers and two port tubes, you would take a total of four near-field measurements and add them together, after multiplying each one by its respective diameter. If some of the radiating surfaces are rectangular, you can use the diameter of a circle with the same area. Alternatively, you can weigh all measured nearfield pressures by the square root of the area, each respective radiating surface before adding them together. The Keele approach seems pretty straightforward, but you must be careful of some things. First, Keele assumes all radiating surfaces are mounted on an infinite baffle. Under this condition, the radiation is into a “half-space” or a solid angle of 2π. However, most loudspeakers have relatively narrow baffles so they become omnidirectional at low frequencies. For this reason, the Keele approach may over estimate the low-frequency sound pressure level. Second, the near-field pressures are complex quantities — that is, they have both magnitude and phase. If more than one radiating surface is involved in the testing, a simple pressure magnitude measurement is not enough. You need a system that measures both magnitude and phase to sum the responses correctly. Third, if radiating surfaces are close together, measurements may be contaminated by crosstalk. Finally, the upper-frequency limit on port pressure measurements tends to be much lower than a diaphragm of the same diameter. Even with these caveats, the technique is useful when there is no anechoic chamber. It’s time for an example. Consider the far-field on-axis response of the two-way monitor first examined in Figure 2. Let’s look at the low-frequency response using the Keele approach. This speaker is vented so, both the woofer and port near-field responses must be measured. The results are plotted in Figure 4a. For the port measurement, the microphone was placed in the plane of the port exit. The scaled version of the port response is also plotted in Figure 4a. Now you can see that it is more in line with the woofer level. Before leaving Figure 4a, there are two interesting points not directly related to near-field testing. 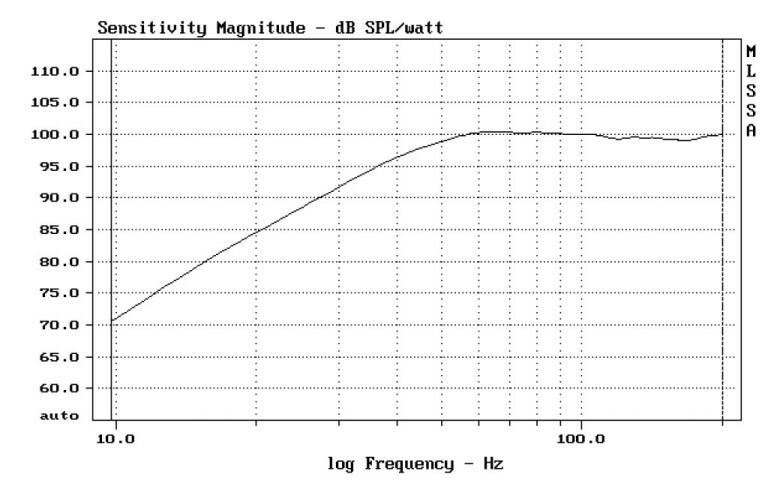 First, the sharp dip in woofer response at 37.6 Hz indicates the tuning frequency of the vented enclosure. In general, this value is more accurate than one obtained from the impedance curve, since it is not corrupted by voice coil inductance. Figure 4a: Near-field woofer, port and scaled port responses. 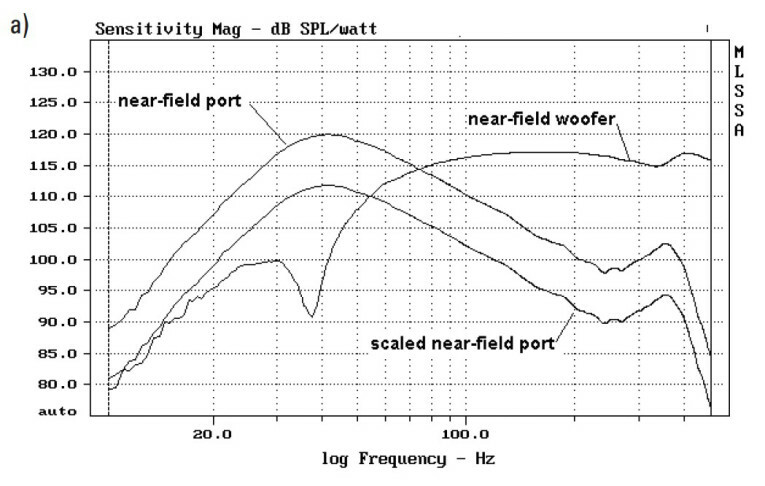 Figure 4b: Weighted sum of woofer and port near-field responses. Second, the up tick in port response around 340 Hz is caused by a standing wave associated with the internal height of the enclosure. 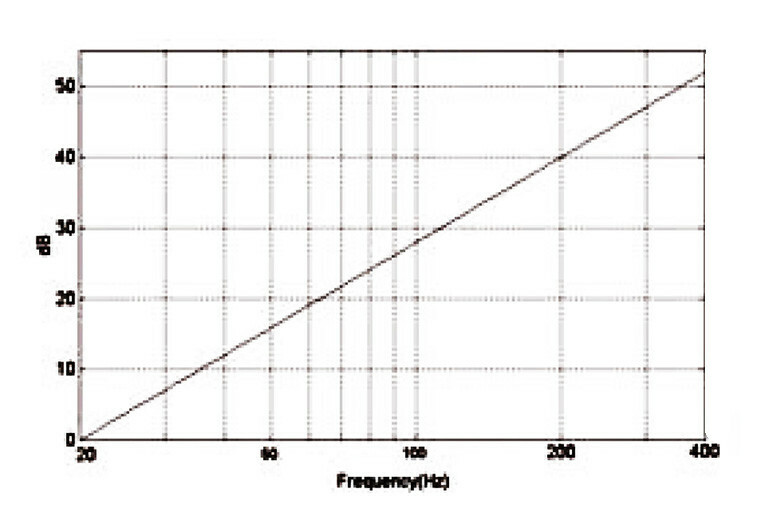 When added to the woofer response, it produces a small dip in the total near-field response at the same frequency. However, this is not heard in practice because it is almost 15 dB lower than the woofer output and because the port exhausts to the rear of our two-way monitor example. Adding the woofer and scaled port near-field responses provides the complete low-frequency response. This result is plotted in Figure 4b. At this point, the shape of the loudspeaker’s low-end response is apparent. Now, splice it to the measured far-field on-axis response of our two-way monitor example. The near-field data are valid below 780 Hz, but we have the small dip at 340 Hz. The farfield data are valid above 285 Hz. Clearly, the two graphs should be joined somewhere in the 285-to-340-Hz range. Regardless of the point chosen, the near-field response should always be brought into coincidence with the far-field response since the latter represents the true loudspeaker sensitivity. Figure 5a: Two-way monitor far-field and near-field responses. Figure 5b: Two-way monitor full range response. In Figure 5a, I have shifted the near-field response level to meet the far-field curve just below 300 Hz. This point selection is somewhat arbitrary, but the result shown in Figure 5b looks reasonable. Notice that the response in the 70-to-200-Hz range is slightly elevated relative to the average far-field response. This may be a consequence of the “half-space” assumption in Keele’s work. Absent an anechoic chamber, the near-field approach provides a good estimate of the low-frequency extension of the two-way monitor. Using the work of Benson, Small showed that, at low frequencies, there is a simple relationship between the sound-pressure level at a distance from an enclosure and the internal pressure within the enclosure, regardless of the number of radiating surfaces. [3, 4] This is an amazing result! pR is the pressure at a distance outside the enclosure. pB is the pressure inside the enclosure. k is a constant. f is the frequency in hertz. It is in decibels in Figure 6 for a starting frequency, f0, of 20 Hz. Now, the process is very simple. All you need is an AC voltmeter with a decibel scale, an audio oscillator, a good microphone, and an amplifier. Start at 20 Hz. Increase frequency in 10-Hz steps. Read the internal pressure in decibels off the AC voltmeter. Add the appropriate correction using the plot in Figure 6. Repeat these steps until reaching 400 Hz, and plot the results. I have dubbed this process the “Microphone-in-Box” technique, or MIB. PR is the pressure-response shape. Scaling it to the far-field response is still necessary. As with the near-field approach, there are some caveats to consider when using the MIB technique. First, there is the same half-space assumption as in the near-field approach. Second, it is assumed that the pressure pB within the enclosure is uniform. Once standing waves build up, the equation breaks down. Small thought the data would be good up to a frequency where the largest dimension of the enclosure equals 0.125 of a wavelength. My experience indicates that this assumption is somewhat pessimistic. In practice, it is fairly obvious from the data where the technique breaks down. There are also some effects at higher frequencies due to enclosure losses that I will not discuss here. Figure 6: The 40*log(f/f0) in dB. Figure 7: Two-way monitor MIB measurements. Let’s take a second look at our two-way monitor with the MIB technique. I have programmed my MLSSA system to take the in-box measurement and automatically apply the correction curve of Figure 6. I passed a microphone through the port tube and placed it close to the geometric center of the enclosure. Figure 7 shows the in-box pressure measurement taken at that location. The in-box pressure response peaks close to the box tuning frequency of 37.6 Hz. Above and below that frequency in-box pressure response fallsoff by 12 dB/octave. 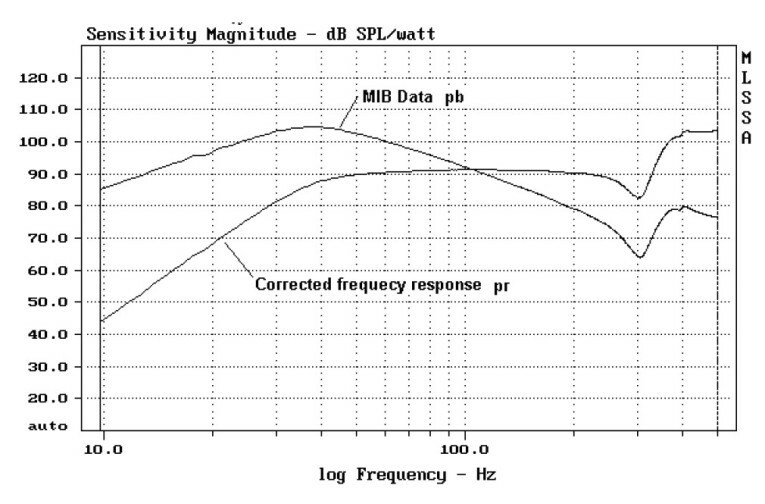 After applying the correction, you get the low-frequency response also shown in Figure 7. It is clear in this example that the MIB technique breaks down somewhere above 250 Hz due to the standing wave within the enclosure. Figure 8: Comparing near-field and MIB responses. It is interesting to compare the two low-frequency response methods. This comparison is plotted in Figure 8. Agreement is quite good between 50 and 200 Hz. 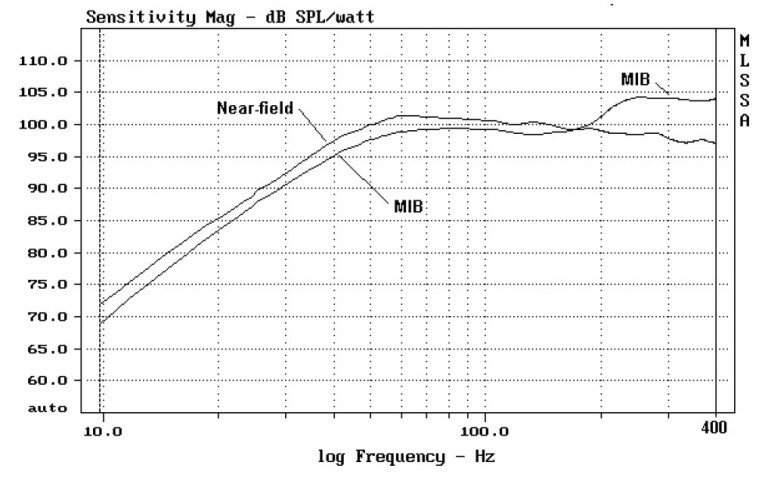 However, below 60 Hz, the near-field result rolls off more quickly than the MIB result. I tend to believe the MIB result below 50 Hz. There are two reasons for this. First, below fB, the woofer and port are out-of-phase, so the response in that range results from a subtraction of two relatively large quantities to get a small difference. A small error in the effective diameters of either the port or woofer, or both, will lead to a response error here. Second, the near-field signal-to-noise ratio (SNR) is poor at very low frequencies, requiring several averages of the data to get a reliable result. This point is illustrated in Figure 9. Here the woofer near-field data is plotted after four averages. The MIB in-box pressure is not averaged at all. The input signal level is the same for both plots. The difference is obvious. I used 16 averages to get the near-field results shown in this article. Of course, you can increase the test-signal level to get a better SNR, but you must be careful. If the port velocity gets too high, the port response becomes nonlinear and the results are invalid. Figure 9: An illustration of the signal-to-noise issue. 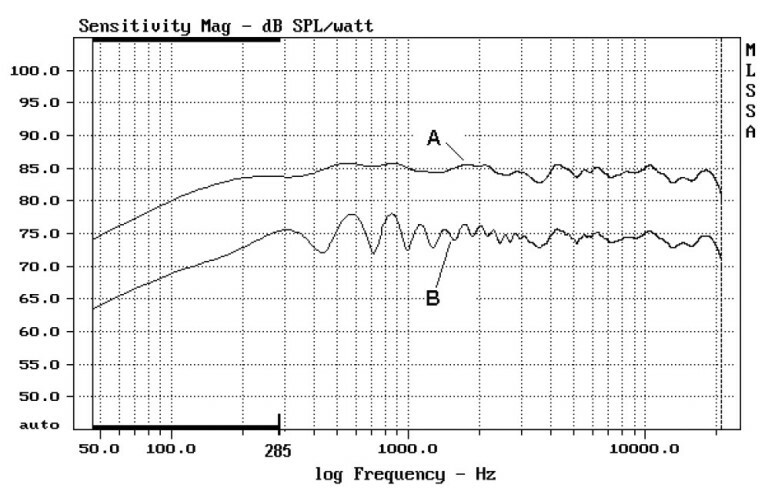 As a final example, let’s look at results from the testing of a sealed-box subwoofer with two 12" drivers. These tests were run to get the unequalized subwoofer response. 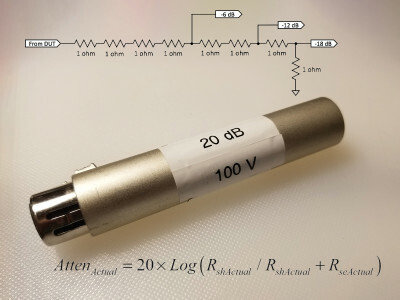 The data was then used to design an electronic equalizer for the subwoofer. Near-field and MIB data are plotted in Figure 10. Near-field measurements of both woofers were taken and added together. The woofers are mounted on opposite sides of the enclosure so there was little chance of cross-contamination. The near-field magnitude responses of the two woofers were identical and could be added together without regard to phase. Fortunately, in this example, there was no port response to consider. A 0.75" hole had to be drilled in the test box to insert the microphone for the MIB test. The space around the microphone cable was sealed with Blue Tac. 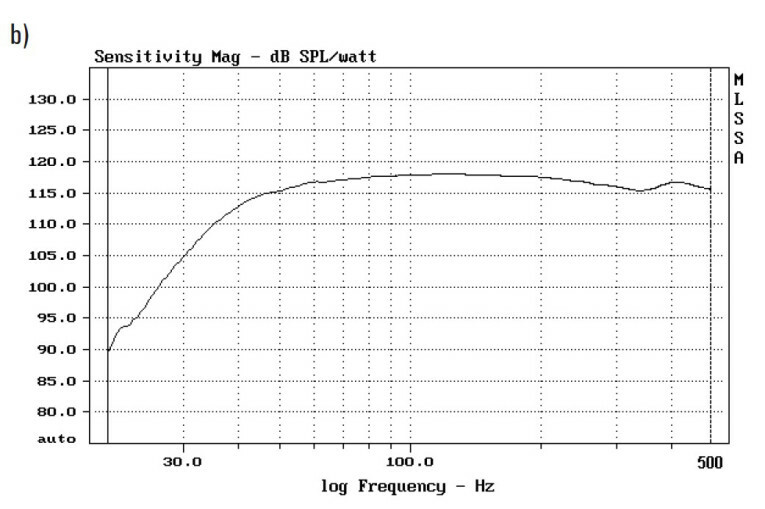 Looking first at the near-field result, it is relatively smooth from 10 Hz all the way out to 400 Hz. There is a gentle rise of about 1 dB in response centered around 60 Hz. The MIB response is flat in this region, but breaks down above 200 Hz. 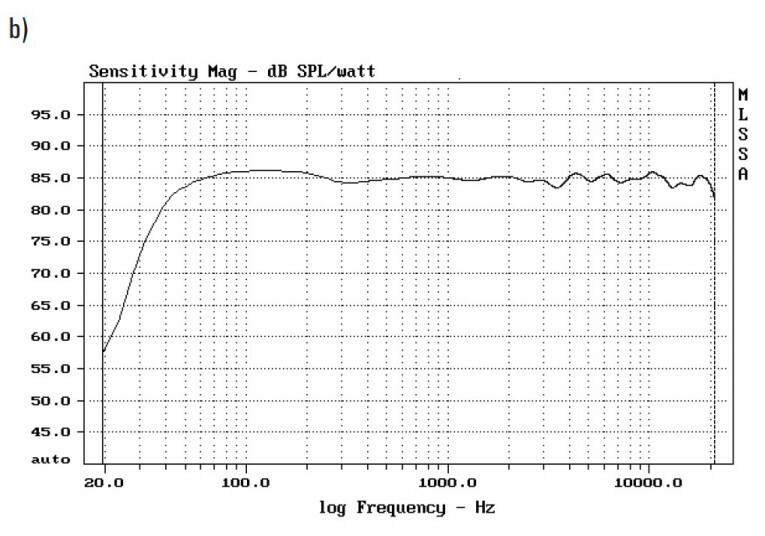 Both responses show the expected 12 dB/octave roll off below 40 Hz. Which one is right? It is difficult to know. But remember, both techniques just give us the response shape. We can change the relative level. If we set the two responses equal at 100 Hz, the curves then differ by no more than 1 dB anywhere from 10 Hz to 160 Hz. For design purposes, I averaged the two responses. The result is shown in Figure 11. For subwoofer equalizer design, data up to 200 Hz was sufficient. Figure 10: Example of a subwoofer. 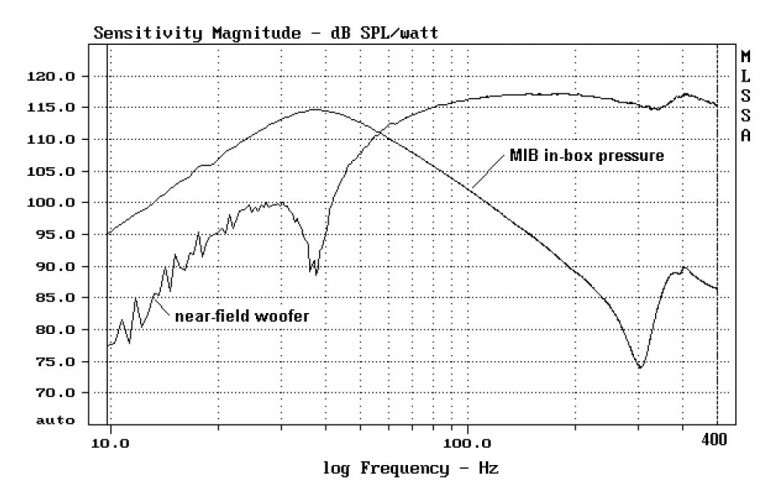 Figure 11: Average of near-field and MIB subwoofer responses. Both techniques described in this article produce reliable estimates of loudspeaker low-frequency response in the absence of an anechoic chamber. Both techniques agree reasonably well given their different approaches to the problem. On the plus side, the near-field approach tends to be valid over a wider frequency range. 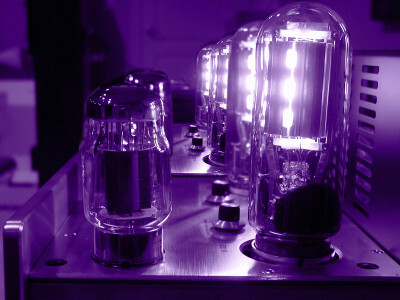 But, except for the single-woofer case or the sealed-box subwoofer example, phase information is required to properly add the individual radiating surface responses. Also, response error below a vented speaker’s tuning frequency is possible. Increasing the drive level for better SNR can help in this case. The big advantage of the MIB technique is that it requires only a single measurement of in-box pressure to get speaker response, regardless of the number of radiating surfaces. As a result, phase data is not needed and manual point-by-point measurements may be used. Author’s note: The test equipment listed below was used to develop the data presented in this article. D. B. Keele, “Low-Frequency Loudspeaker Assessment by Near-Field Sound Pressure Measurement,” Journal of the Audio Engineering Society, 1974. J. A. D’Appolito, Testing Loudspeakers, Audio Amateur Press, 1998. J. E. Benson, “Theory and Design of Loudspeaker Enclosures,” IREE (Australia), 1969. R. H. Small, “Simplified Loudspeaker Measurements at low Frequencies,” Journal of the Audio Engineering Society, 1972. This article was originally published in audioXpress, June 2012.